If you would like the printer friendly version please choose either PDF or Word. There are six major questions any homeowner should have regarding water losses. How old are your pipes? According to a 2012 Water Infrastructure and Sustainability fact sheet done by the EPA the average age of water pipes when they start to break is 47 years. If your pipes are older than that you might want to consider getting them replaced. Do you have any trees near your water service lines? Roots tend to seek out water pipes because they have water and oxygen running through them, two things that trees need to sustain life. However, when roots get into the pipes they can cause clogs and blocks that can lead to serious problems and need for repair. Do you have clay soil? Clay soil is extremely corrosive for your pipes and you will most likely need to get them replaced sooner rather than later. What are the warning signs? They can be so small that it could be hard to not overlook. Cooking at home a lot could lead to grease buildup in your sewer or drain lines, a stammering faucet could show that a line is leaking somewhere, a clogged or slow draining toilet could be a sign of your sewer line being clogged. Catching these things in time could save you a lot of money not only on a cleanup but on your water bill! Do you live somewhere that seasons change suddenly? We live in the Northeast. We can pretty much determine when the weather is about to change but lately it seems like one day it is summer and the next day it is winter. Just remember that water lines are more susceptible to break during extreme temperature swings. Do you know what your pipes are made of? There was a study done in 2012 by the Utah State University Buried Structures Laboratory that showed nearly a quarter of all water mains in the United State are more than 50 years old. The older pipes are either made from clay, steel, or tile. They are materials that are more prone to deteriorate over time. If your home was built before the 1980’s make sure you check your pipes and see what they are made of. Chances are they will need to be replaced if they are made of clay, tile, or steel. There is more to Thanksgiving than just turkey. There is also mashed potatoes, gravy, stuffing, green beans, pie, ect. Cooking for a big group can be stressful, it is like you need more than one of you to keep an eye on everything all at once. Well the NFPA has some safety tips to make it all a bit easier for you. Staying in the kitchen can sometimes be hard, your friends and your family are over and you want to be the host/hostess with the most/mostess! Please stay in the kitchen though it is so easy for a pot to boil over in the 30 seconds you take your eyes off it! Also remember to children at least 3 feet away from the stove. That rule also applies to the family members trying to steal a fingerful of mashed potatoes. Keep your floor around your stove clear. You don’t want to trip over someone’s little toy truck as your mashing up 10lbs of potatoes! Watch out where you set your cooking utensils down. You never know when a kid will come from nowhere and steal a knife off the counter! Make sure electric cords from an electric knife, coffee maker, plate warmer, or mixer are not dangling off the counter. The cords could get caught or pulled on and everything could come tumbling down! The Red Cross would like to remind everyone that there are more than 4,000 house fires on Thanksgiving Day. You want your friends and family to stay safe on this wonderful day of thanks so please remember to follow these tips. Check your smoke detectors before you start cooking your holiday meal! Most people check them just before family comes over but it is very important to check them before you start cooking. Smoke detectors save lives. Keep potholders and food wrappers at least three feet away from heat sources in the kitchen when they are not being used. Potholders are a wonderful thing but they are also very flammable things. Turn off your stoves and other appliances when you are finished using them and don’t feel embarrassed if you feel like you need to go back and check if they are really off. Have you ever left your house and wondered if your coffee pot is still on? Don’t be afraid to turn around and check on it! Set timers to keep track of your cooking times. When you are cooking a big meal for family and friends it can be difficult to remember what comes out of the oven and when so just make sure you use timers. Turn the pot handles inward on the stove to avoid any accidents. It is very easy to just bump a handle and knock over a hot pot of green beans. Don’t want to end up with a burn on a holiday! 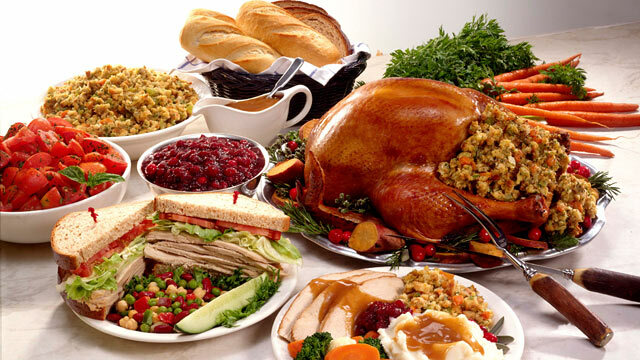 Food safety tips in general are very important on this holiday. When thawing a turkey in the refrigerator allow 24 hours for every five minutes, when you are using cold water to thaw a turkey allow 30 minutes per pound, and if you are using a microwave to thaw your turkey remember to start cooking it immediately after you take it out of the oven! It is recommended now to not cook stuffing inside the turkey and rather to cook them separately to make sure they are both thoroughly cooked. If you see someone choking and they can’t speak or cough call 911 right away and only perform the Heimlich maneuver if you know the correct way to do it! You can cause serious bodily harm if you are not properly trained! If you happened to be burned during meal preparation or even meal eating make sure you take proper precautions. Cool off the burn with a cloth soaked in cool water, cover loosely with bandage or cloth, take an over the counter pain reliever to help with pain and swelling, ibuprofen is highly recommended, watch for infection, and if the burn is bad please go to the Emergency Room and allow professionals to take care of it! Stay safe and warm during the winter season. If you or anyone you know is struggling make sure you give them the National Suicide Prevention Lifeline number. Just showing that you care could make a difference. They are there 24/7 to take calls and save lives 1 (800) 273-8255.